Where do I use my GAP voucher code? Not only is GAP accessible, chic and fun for everyone, it’s also one of the most affordable high-end brands on the market meaning it deserves a place in everyone's wardrobe. Having been trading in women and men's fashion since the peak of the swinging 60’s, GAP is a globally recognised brand which in this day and age, is all about quality, American-inspired clothing suitable for every member of the family. What’s more, you can expect quality at affordable prices and with the help of NetVoucherCodes, you can guarantee you will always be getting a bargain price. At GAP, whether you’re buying underwear or premium denim, they promise timeless style & quality for much less. What draws GAP to people all over the world is their beautiful and comprehensive departments suitable for the modern family. Enjoy Baby Gap or Gap Body designed for sleepwear and maternity clothing. With a passion for providing fashion for all types of people from different walk of life, GAP aim to inspire and want you to enjoy their products loud and proud. Gap Fit boasts an exciting selection of fitness fashion whilst the toddler department designs clothing to keep the little ones comfortable, on-trend and snug! Feel amazing everytime you leave the house wearing GAP and shop with confidence that you can stay within your budget too. Uncover GAP’s latest range of athleisure clothing which collaborates functional gym style and street fashion to create the perfect bridge between working out and staying on trend. Browse stylish jackets and tees, shorts, leggings and much more - all designed to be transitional and a great addition to your active wardrobe. Using one of our GapFit Voucher Codes, you can grab superb discounts on this great new collection so you can be the envy of your friends for less. The more confident you look and feel in your workout gear is a testament to the quality of your workout so be sure to shop GapFit for the ultimate boost. Get more information on delivery here. If you wish to return a product, you must do so within 30 days of your order date. Products must be unwashed and unworn and in a resalable condition. Jewellery and Swimwear cannot be returned for hygiene reasons unless their seals are untouched and intact. For more Returns info, see the Online Returns page. Find the opening and closing times of a GAP store near you using the Store Locator tool online now! 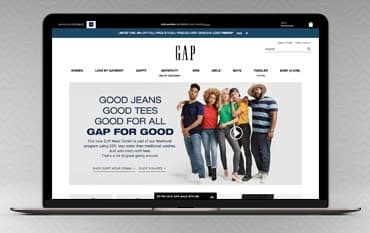 Since its beginning back in 1969 in the heart if San Francisco, GAP has become a leading, global brand in the world of modern, casual fashion for men, women and children. Boasting classic design, clean lines and colour - you can pay less for your goods online when using a GAP Voucher Code which can guarantee you great savings off your goods this season. Check out the new season staples and see what trends GAP can offer you today.